We would like to congratulate Jimmy Chatfield on his commitment to Yale University! Here are Jimmy’s recruiting story and interview after his commitment. Good luck as a Bulldog! I stayed in contact with several target schools throughout the year, sending them updated videos approx. once per month. Ryan Thompson with SportsForce also made a more consolidated highlight video and helped us reach out to our target schools as well. I had a great high school season, went to JO’s (Junior Olympics) in AZ, then Head First in Sacramento followed by the Stanford camp. Interest really started to accelerate at the latter two camps as I hit, fielded, and pitched well. Offers started to come in at the Stanford camp, and on the last day of that camp, several schools were making either offers or inviting me to visit the campus. 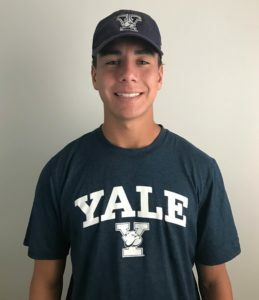 Yale was in our top three from the start, so when they offered, it was over! Yale because it’s an elite school that we felt had the right balance of sports and scholastics. Initial help in establishing the target school list was good, but the communications directly with coaches, and knowledge of the coaches’ needs/priorities/interest was paramount! We have to thank Ryan Thompson for his work. Also, his personal interest, assessments, and coaching were huge. It’s extremely important that you take charge of the splicing, compiling and sending of video updates to coaches. Coaches want to gauge a student-athlete’s interest in their program and get to know them. Make sure a professional video is both shot and edited to increase the chances of getting a college coaches attention. SportsForce can counsel the parents on the proper angles to shoot for hitting and fielding. Even if the student-athlete attends a camp or event and have professional video services available, the parents should film the assessment events as well…there’s no such thing as too much video! Yes….for families that really don’t have a plan or experience in college sports, they need help. For our family, it was really Ryan Thompson that made all the difference! If your son plays baseball for his junior high or middle school team and demonstrates his talent on the field, it’s never too early to start planning for college. In fact, most colleges select students well before their senior year when it comes to qualifying for scholarships. This why many parents set out to find the best recruiting websites for baseball to maximize the chances of their child getting a scholarship from a college or university. Recruiting websites are those that offer professional assistance in providing your son the best chances to land a baseball scholarship. They start by having those who have worked within the system, have the right connections, and understand how to properly market your son’s talents so that college and university baseball coaches will take notice. Of course, finding the right website is another matter since it takes a unique combination of attributes for it to be right for your child’s chances. Here are a few things that you need to look for in finding the best recruiting website. 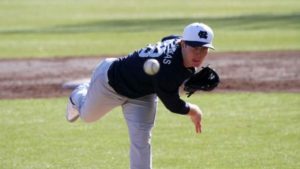 Evaluation: First and foremost, it’s all about the talents, abilities, and attributes that your child offers in getting on a college baseball team. A proper evaluation will help guide the networking and marketing process so that the focus is on the coaches who will be most interested in having your child on their team. This might mean a Division I school, but keep in mind that Division II offers considerable possibilities as well. Even Division III schools that have no scholarships may still be good choices because they can offer reductions of their tuition that are similar to getting a scholarship. Connections: It’s all about who you know when it comes to finding the right website for your needs. They should have as part of the information they provide to you a network of colleges and universities where they can contact those in charge to present the talents of your child. Keep in mind that even with the right connections, this really means just getting a foot in the door. The rest will depend on the talent of your son and the interest coaches have in wanting them for their team. Marketing: It’s not how many marketing services, but how they are packaged to provide your child the best chance of getting noticed. Today, it’s about short videos that highlight your child’s abilities, putting out their name in the right places, and attending the camps and tournaments that help get them noticed. At SportsForce, we run the best of all recruiting websites for baseball prospects because we combine an experienced team of professionals with the right connections and methods to maximize the chances of your child getting a scholarship. The experience combined with the knowledge of how to reach the right people means that SportsForce can properly market the talents and abilities of your baseball player so they have the best chance of landing an athletic scholarship. Considering how competitive the field is when it comes to landing a baseball scholarship, having a guiding hand like SportsForce can make all the difference.